The pressure is always on for new and existing fashion brands to deliver quality content online. Creating aspirational content that aligns with your brand identity and encourages conversions is a tall order, particularly in today’s saturated market. Companies that blog receive 97% more inbound links to their website, and have an average of 434% more indexed pages than those that don’t. As such, any brand or retailer not updating their site with regular blog content is likely to be missing out on key traffic opportunities. Trends within the blogging industry have a tendency to come and go, yet there are some post formats that can be fully optimised for SEO and used to underpin your ongoing marketing efforts. Here are a few ideas to get you started. Posts that focus on styling this season’s key garment can bring increased organic traffic to your site, as relevant keywords begin to trend in search. 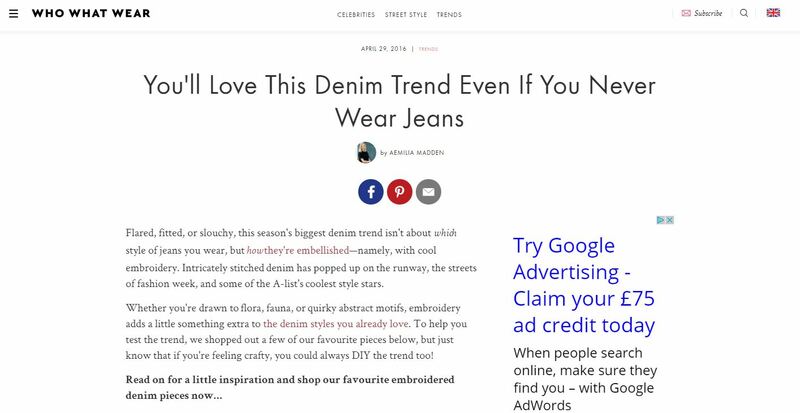 It’s a tactic regularly used by influential fashion blogs such as Who What Wear, who’s guide to styling embroidered denim sees them ranking well for this high-volume search term. Establish your brand as a leading knowledge resource by breaking down key trends with each new season, complete with e-commerce links and product recommendations where appropriate. Content that advises people on how to do something is always a winner in natural search. Consider how to make these posts fit around the season’s trends – such as this guide to hemming your own jeans from Refinery29. Above all else, your content should offer readers something of genuine value. Share information that will genuinely come in handy, and you’ll stand a stronger chance of encouraging repeat visits. People love to discover more about the faces behind the brand, making your fashion site more personal and relatable. 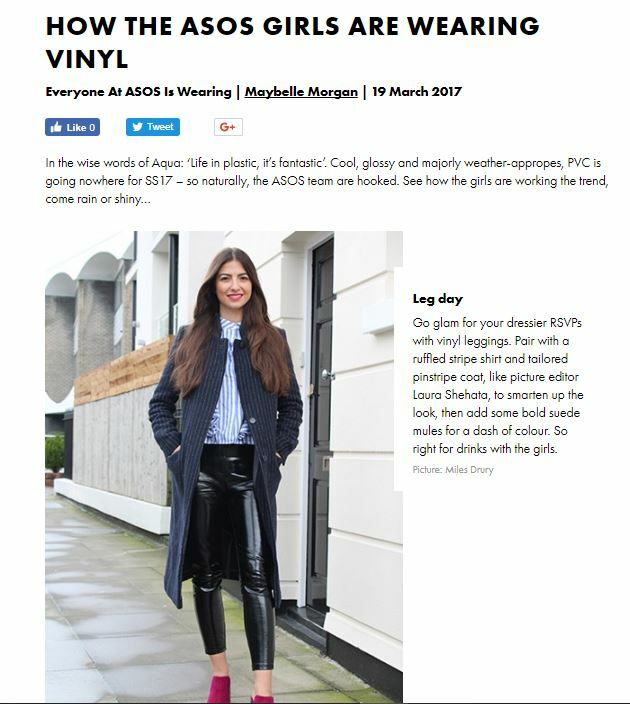 Take cues from retail giant ASOS and keep the content fashion-led by showcasing what you or the team behind the blog have been wearing. Celebrities have a huge influence on our style, so consider doing a weekly round-up of style inspiration, and link to e-commerce pages where possible. ‘Sharing the love’ is very much a buzz word within the blogging industry. The least you’ll get from linking to your favourite influencers is an increase in brand favour – the most, a valuable backlink. Competitions tend to perform well on social, with each share contributing to increased brand awareness. Not only will mentioning the names of key fashion insiders see your brand ranking for these highly searched terms, but interviewing them is a great way to encourage backlinks and shares from their own social media channels. High-end retailer Matches Fashion have nailed this with their ‘My Fashion Life’ series, in which they’ve interviewed the likes of fashion icon Alexa Chung and Vogue editor Elisabeth von Thurn und Taxis. Evergreen content is just as beneficial within the fashion industry as any other. Underpin trend-led posts with a guide to the essentials that will last season after season. The fashion industry is notorious for being fast-paced. Regularly updating your blog with new arrivals will encourage repeat visits from users who are keen to keep their finger on the pulse. Fashion blogging is all about showcasing an aspirational style. Blog posts containing images get 94% more views than those that don’t, so focus on producing visually appealing content that will inspire your target audience. Check out sites like Polyvore for some fresh layout ideas. Even if you’re a retailer, consider going into detail about brands and designers that are stocked on your site. These case study-style posts are a great way to demonstrate your industry knowledge. Influencer marketing can feel like a big step for those with no experience, yet the benefits for big and small businesses cover everything from increased brand awareness to valuable backlinks. Whether humorous, nostalgic or informative – there are a multitude of angles you could take to make this style of post even more shareable. Swimsuits styles, jean cuts or ankle boots – the opportunities are endless. Comprehensive guides will also allow you to target multiple keywords and further establish yours as a voice of authority. Visually appealing gift guides can lead to big traffic wins, particularly during the festive season. Include clear links to e-commerce pages to turn views into valuable conversions. 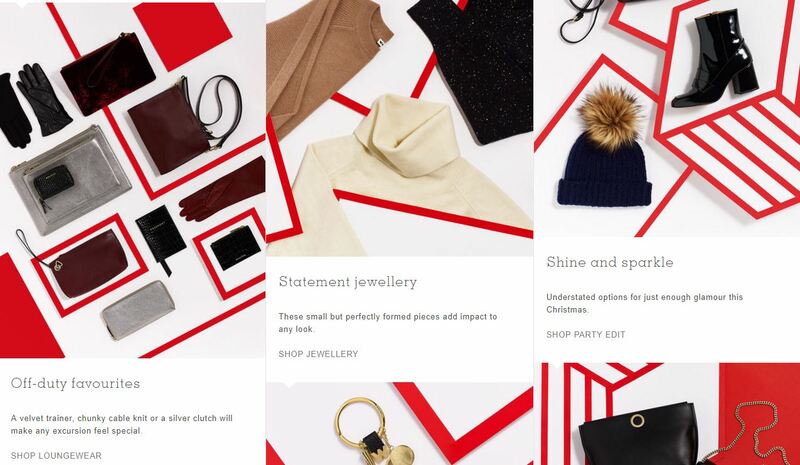 The 2016 Christmas gift guide from Whistles was effortlessly on-brand and packed with signposts to product and category pages. Everyone loves a bargain. Shout about sales, deals and offers happening on site or simply provide advice on how to dress well for less. Personality quizzes are a surprisingly successful method for generating views and leads. They’re also a relatively cost and time effective way to encourage user engagement. Blogging is commonly regarded as a space for brands to let go and immerse themselves in a more creative side of digital content. Rightly so, yet it’s wise to consider how blog posts can be tailored to support your marketing and SEO efforts at the same time. For more information on developing an effective blog content strategy for your fashion brand, get in touch today. next post: How much do we really trust the internet?